Creates dynamically updated point UDP (user defined properties) on CogoPoints showing alignment station & offset. Open the drawing containing the alignment and points. Initiate this tool from the menu, ribbon or command above. Select the alignment by picking it in the drawing. Choose a point selection method (such as drawing) and select CogoPoints to process. At this point the UDP has been assigned to the CogoPoints, you can review the information in the PROPS dialog (bottom) by clicking one point. While you can change it, it's not recommended. Most users will want to display the station/offset on the point, this requires a quick modification to the point label style. In the Toolspace panel, choose the Settings tab. Expand the Point category by clicking the [+]. Expand the Label Styles section. Click the Label Style you use to select it, then right click and choose Edit. On the Layout tab, set the Component Name to "Point Description"
In the right pane of the dialog, click the end of "<[Full Description(CP)]>" and press enter for a new line. In the Properties tab, choose "Station" in the dropdown, then click the adjacent right arrow [>]. In the right pane of the dialog, click the end of "<[Station(CP)]>" and press enter for a new line. In the Properties tab, choose "Offset" in the dropdown, then click the adjacent right arrow [>]. Click [OK] twice to return to the editor, the points should now display the station/offset. This appends the station/offset information under the point description, there may be other ways to display the fields if you need them in different positions. Initiate the Point Table Creation tool. Choose the table style to modify, click [OK]. In the [Data Properties] tab, click the [+] in the lower right. Use the horizontal scroll to scroll to see the column. Double click the Column Value cell, choose "Station", click [>], click OK. Double click the Column Header cell (right of Description), enter “Station” in the right pane, click OK.
Repeat at step 4 for the "Offset" UDP values, then close the Table Style dialog. Click the “[+] No point groups selected” and select a group or "_All Points". Optionally reorder the columns by dragging them to the left. Click [OK] and pick a point for the table. Note: If dynamic update is turned on, the UPD will change if a CogoPoint is moved in the drawing (by any command). This reflects on the label and even the table if it has been created. This can be turned off in the OPTIONS dialog, under the C3DTools tab. There has been a request to provide the station/offset values as doubles. The reason we chose strings initially is to allow for the "+" symbol in the station, and L/R at the end of the offset value (+/- were recently added). We cannot break compatibility with the existing users data, so the plan is to provide two new optional UDP doubles under the "C3DTools.Alignment" with the names "StaDbl" and "OfsDbl". Both sets (string/double) are now optional. The code that fills in the values will check for these new names and fill in all four if they exist. 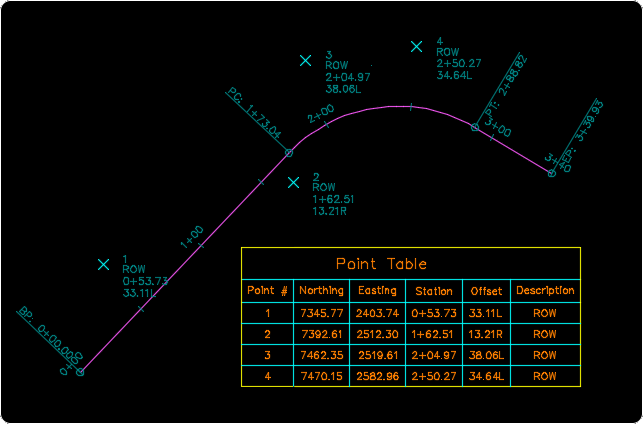 Can use the Civil 3D formatting options to force a plus sign on the labels. This also lets me easily export Station/offsets to spreadsheets to do further calcs with them.